Big Sur is a very worthy road trip destination for anyone who loves to be outdoors and experience nature. The rugged stretch of coastline has stunning beaches and mountains and also some really great restaurants. Just try not to be in a rush to get there because there are a lot of cool places to stop on the drive from San Francisco. Oh, and in case it wasn’t clear: you’re taking Highway 1. Sure, it takes a little longer, but the views of the Pacific Ocean, rocky bluffs, sandy beaches, towering redwoods, and vibrant green hills make it worth the extra time spent on the road. If you go to any of the beaches in Half Moon Bay, there’s a chance you’ll see a gray whale, but if you turn onto highway 92, you’ll definitely see some dinosaurs. 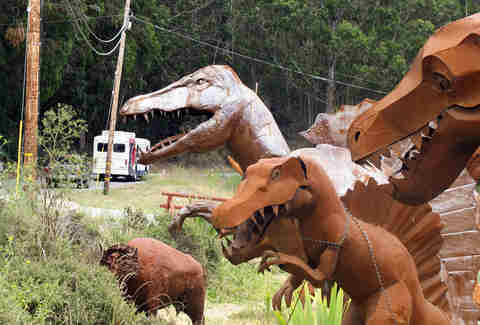 Spanish Town is a little village where you’ll find artisan shops and… a bunch of gigantic rusted metal statues of prehistoric animals. There’s a Wooly Mammoth with “hair,” a Tyrannosaurus Rex with sharp, pointy teeth, a docile Brontosaurus, and even a super tall giraffe. It’s one of the most unique things you’ll see in Half Moon Bay (or anywhere, really), and all of the Instagram likes you’ll get definitely make it worth a stop. 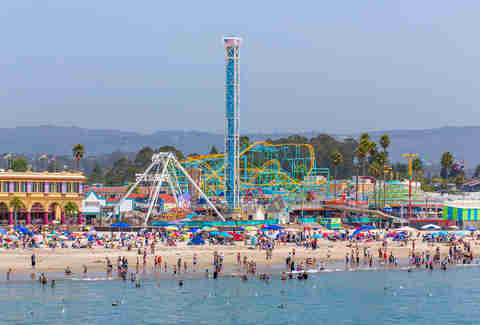 This oceanfront amusement park is the oldest one in California, and also host to two of the coolest amusement park rides in the state: A historic wooden roller coaster built in 1924, and a carousel built in 1911 — both National Historic Landmarks. Once you've had your fill of rides and your adrenaline peaks, relax by dipping your toes in the ocean just a few feet away. 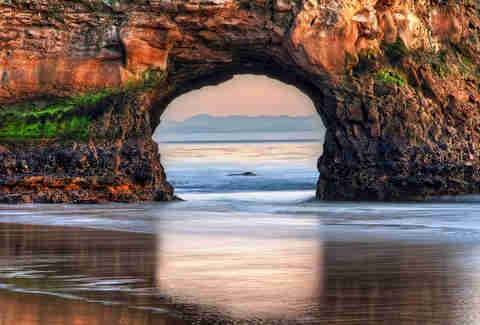 Natural Bridges State Beach is famous for the natural arch in the huge rock located right off of the shoreline. Hence its name. This stop is a must as it’s the only one of the three original arches that remains and is in danger of collapsing due to erosion. So if you don’t see it now, you might not see it ever. Okay, the sad part is over now. After you take your photos, keep an eye out for migrating gray whales, monarch butterflies, and sea otters. There are also tide pools where you might be able to spot hermit crabs, urchins, and sea stars. Look at you, Jacques Cousteau. You probably know Pebble Beach because of its famous golf course, but it’s got some other pretty picturesque stuff as well, all of which you can see on this scenic drive. Stop at Fanshell Overlook to view a white sand beach where harbor seals hang out, Cypress Point Lookout for one of the most dramatic views of the coast in the entire state, and, of course, The Lone Cypress, which has stood alone, clinging to its granite pedestal for over 250 years. 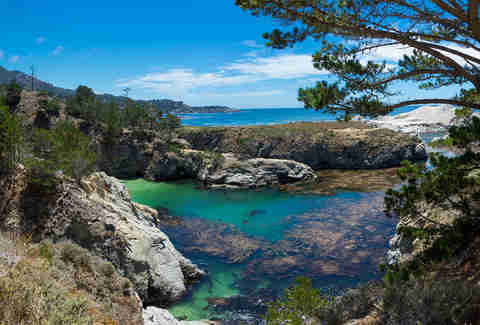 Like pretty much everything along the California coast, Point Lobos State Natural Reserve is full of natural beauty. Rent a kayak and find the turquoise and green waters of China Cove, which is tucked away in the rocky cliffs. If you’re not into sea kayaking, there’s also a hike that takes you to the secluded cove. It’s a super mellow walk; the hardest part will be climbing back up the steep staircase that takes you down to the beach. 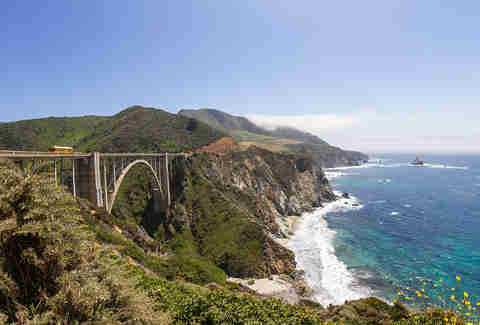 In order to get to Big Sur, you have to cross one of the most photographed bridges in California. 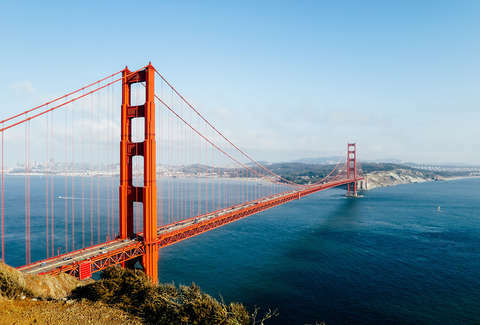 In fact, it would probably be the most photographed bridge in California if not for the pesky one that spans the Golden Gate. Pull into one of the designated turnouts before you cross the bridge so you can get your pic. 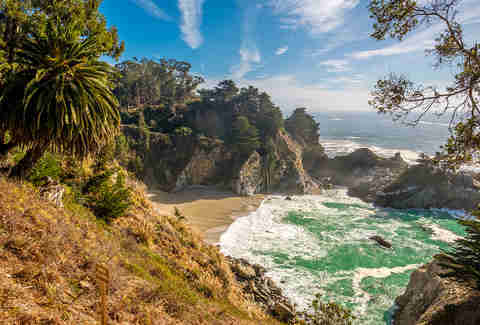 Inside of Julia Pfeiffer Burns State Park you’ll find a mile-long trail along a 3,000-foot ridge. That trail takes you to an 80-foot waterfall which lands on the beach and feeds directly into the ocean. McWay Falls is one of two tidefalls, a waterfall that empties into the ocean, in California, and since no one is allowed to go on the beach, your photos will be people-free and perfect. Head to this secluded beach before sunset to see the last rays of light shine through Keyhole Rock, a natural arch in the water. Be sure to get there a little early so you can see the purple sand on the north end of the beach. It’s pretty much the perfect end to the day.